ITO World Ltd is pleased to announce the availability of four new railway overlays on ITO Map making further details contained within OpenStreetMap visible for the first time. These layers are available globally and the data for them is updated daily. The layers all have 'keys' which can be clicked to link to a page on OpenStreetMap wiki with more details about the layer and ITO Map. 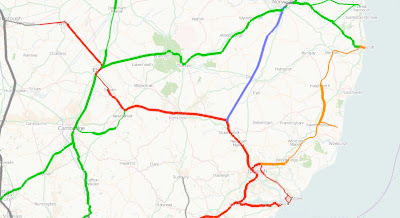 The electrification overlay highlights electrified mainline railway lines in yellow, red and orange (for third-rail, contact line and unspecified electrification respectively). Blue is used for non-electrified lines. Lines where electrification is not known are shown in grey. This example show the third-rail electrified lines south of London in yellow and the contact-line electrification north of the city (click on any image to open the browser with the same view). 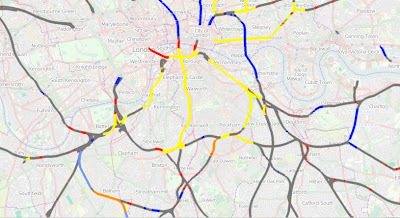 The railway engineering overlay highlights viaducts, bridges, embankments, cuttings and tunnels on mainline rail services (yellow, red, orange, light blue and dark blue respectively). This view of London shows all of these features. The railway stations overlay highlights platforms. Platforms with platform numbers are in blue, those without are in red. 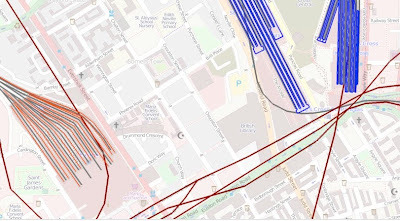 The image below shows that Kings Cross Station and St Pancras Stations have numbered platforms and that Euston has platforms but these don't have references. Finally, the loading gauge overlay indicates the loading gauge to which the line has been constructed which determines the size of trains that can be accommodated. In particular it indicates if shipping containers can be carried. There is virtually no data in OpenStreetMap of this type outside the East of England. ITO will be releasing further layers in different 'themes' in due course (such as sports and landuse) and will be refining and enhancing the existing overlays. We are always happy to receive suggestions and bug reports. 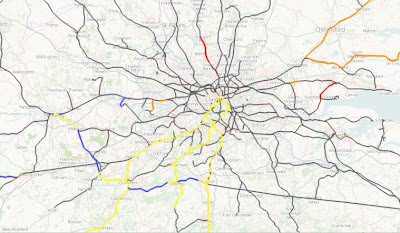 ITO Map has been developed with support from 'Ideas in Transit, a five-year UK government funded research program. I've found Ito map incredibly useful in guiding my mapping. Here's as US centric request: a tiger:reviewed overlay so we can see where tiger:reviewed=no is still the case?